Anegada has been on our list of places to go, because it is there, and because we can. Anegada is the northernmost island of the BVI. Elevation 23 feet. One town (the settlement), and lots of beaches. Long flat white beaches to walk on. We did not plan to come here when we did, we were out for a daysail, realized how quickly we could get there, and decided to go for it. 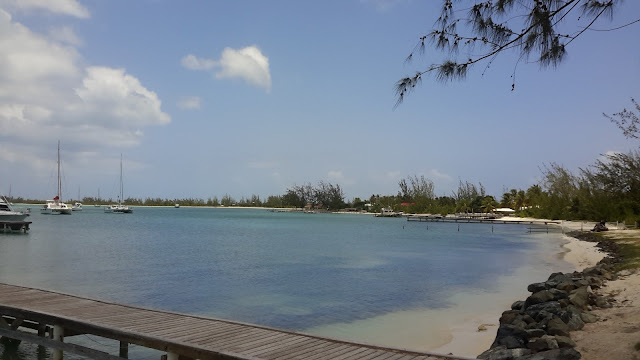 The issue with Anegada is that it is surrounded by reefs and very shallow waters. Hundreds of boats have wrecked here over the years, and we really don't want to add to that number. The main harbor is too shallow for our 7'2" draft so we are anchored out in another harbor, around the corner from everyone else and a 40 minute wet dinghy ride into "town". Anchoring was a bit tricky. 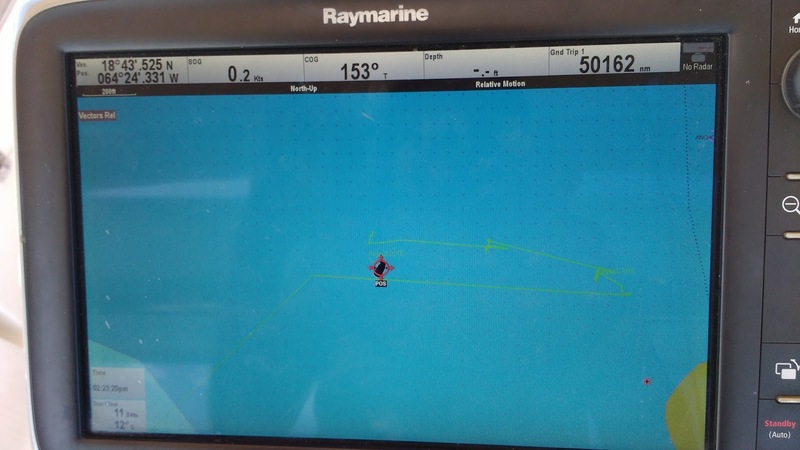 We anchored behind a reef, in water we thought was deep enough and Bob dove the anchor to check it out. The anchor looked fine, but about 15 feet off of our port side he found a coral head about 4 feet below the surface. Since the boat swings on the anchor there was a chance that we could swing into the coral. We decided to move the boat. Chart plotter showing all 3 anchor sets and respective swings. Anchoring #2. Anchor down, Bob checks the anchor, looks good, no coral heads on either side, but there are two other problems. 1) our keel is brushing the top of the grass underneath us and 2) the chain is tucked under another coral head with the potential of getting caught. Time to move the boat again. Anchoring #3. This time we headed out to some deeper water (about 25 feet) looked for a sandy spot, no grass, no coral heads, and let down the anchor. I dove it this time and all looked well, under the keel, along the chain and on either side of the boat. We are now anchored off shore about a quarter mile which makes for longer dinghy rides, but a least we feel better about the safety of Rhapsody.